The experiment chamber is contained in a closed, radiation-proof housing with a transparent synthetic-glass shield. The high vacuum X-Ray tube with the directly heated tungsten cathode and copper anode is positioned in a borosilicate glass chamber with a thin walled, concave ray emission window. A lead glass hood with a collimator causes X-rays to emerge in parallel with the experiment plane and provides a shield against scattered radiation. The horizontal counter tube goniometer consists of a central sample holder and the swiveling arm. In the form of a slight ray, this arms serves as a mount for the GM Tube, ionization chamber as well as experimental devices in slide format or on a 5cm X 5cm base plate. This swiveling arm can be rotated manually independently of the sample holder or at a fixed mutual angle with the ratio of 2:1, for instant, for experiments involving Bragg's refection. The devices equipped with angle and mm scale, position marking for experimental devices, as well as radiation proof bushings for cables and houses. All the experiments(except Experiment No. 2 &7) can be performed using primary items. 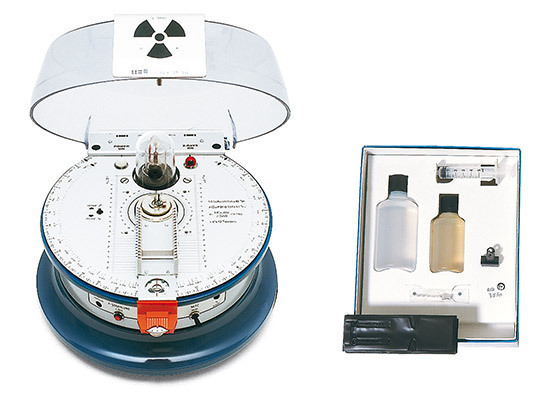 X-Ray energy detector and Set of Fluorescence Samples are required to perform the experiment for Fluorescent Radiation in addition to X-Ray apparatus. X-Ray Energy Detector is needed to perform Mosley's Law experiment in addition to X-Ray apparatus, Basic Equipment Set and Crystallographic Accessories. Bragg's reflection can also be studied by using X-Ray apparatus, Bragg Driver and Basic Set Bragg only.